Los Rios Anglers has exclusive access to this 2 mile stretch of private water. 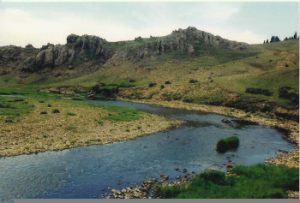 A wide, meandering, meadow stream, the Brazos is high and cold at 10,000 ft. of elevation. Fishing starts in late May or early June, whenever the snow-melt allows vehicles to access the property. 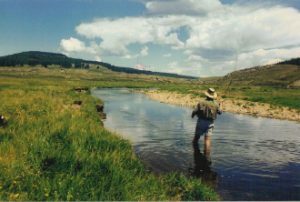 The stream holds mostly Rainbows, and thanks to the river being private and lightly fished for decades, the fish are eager for meadow offerings like hoppers! Also abundant are small feeder creeks full of brook trout, and in the main river we have measured brookies of 16″!!! The property also has cabins available for overnight guests. Although it seems like “roughing it” deep in the aspen and fir trees, the facility also has hot showers, flush toilets, and a wood burning hot tub! 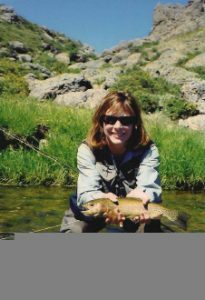 This is an incredible fishing experience that is better than any other private water fishing that Los Rios Anglers has ever been associated with.